Established in 1988, Kelly's Collision started in a rented 2 bay garage. Within three months we grew out of that garage, moved down the road into a five bay garage and hired 3 employees. Due to a bridge project we were forced to relocate. We purchased a lot up the road and built a brand new State-Of-The-Art facility in 2003. Before long we grew into a 15 person Staff. We expanded and put up another building. Building #1 houses our office, waiting room, drive in estimating bay, parts room, paint booth, remove & install area, mechanical bays, and detail & wash bay. Building #2 is used as our structural repair building. In addition, we are a drive in service for 2 major insurance companies. Our team is well trained in all phases of auto body repairs. Kelly's Collision is completely fenced, lit, and has monitored 24/7 surveillance with 16 HD cameras for your vehicles safety. JAIME BENZELESKI has been with Kelly's Collision since 1989. He is a dedicated employee with years of experience who is ASE Certified, Cheif Certified Frame Technician, Aluminum Repair Certified, and Car-O-Liner certified in their Computerized Electronic Measuring System . Jamie is proficient and highly skilled in minor & major repairs. ​His specialty is large structural repairs. JIM HANEY has been with us since 2002. He is ASE Certified, Aluminum Repair Certified, Dan-Am/SATA Training Certified, and Car-O-Liner Computerized Electronic Measuring Program Certified. Jim has an eye for detail. He is highly skilled and his duties include, but are not limited to, Auto Body Technician and German Body Technician. ​Jim enjoys fishing and hunting. SCOTT QUICK joined our staff in 2018. ​He is an R & I Technician and does light mechanical work. Mike Williams, our wonderfully skilled painter, came to us with many years of experience. He takes pride in his work, has a great eye for detail and lays the paint down with precision. We are glad to have him on board. CHET NORTON is a skilled Interior/Exterior Detail Technician who has been with Kelly's Collision since 2010. He takes pride in his work, has an eye for detail, and is the best detail technician we have ever had. ​Chet enjoys fishing, camping and the outdoors. 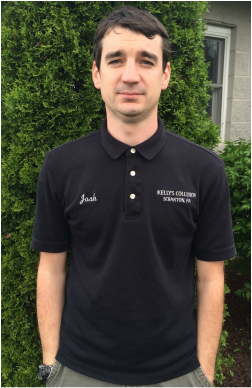 Josh is very experienced, dedicated, and courteous to customers and employees. He writes estimates, orders parts, negotiates with insurance companies, assists with shop duties, and overseas repair process from start to finish. He enjoys working on cars, spending time with his pets, and fishing in his spare time. AMY LEES joined our staff ​​in 2016. She greets you with a friendly smile the moment you enter our facility. Amy is very knowledgeable and will work with you and your insurance company so you won't have to worry about anything. If you have any questions or concerns, Amy will assist you through the claims process. MIKE LAFAY joined our staff in 2015. ​He is a military veteran who served in the army. Mike is a very meticulous body tech who is a creative master fabricator and performs light mechanical work. Mike has a passion for modified cars. ANTHONY MAGRANER joined our staff 2016. His job duties include prepping vehicles for paint. He wet sands, tapes them up, bags them up, and get the vehicle ready for Dave to paint. For fun Anthony is very talented guitarist who plays in Clever Clever.